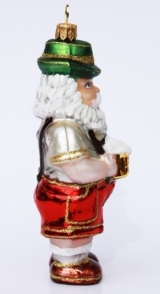 Our traditional mouth-blown & hand-painted glass Bavarian Oktoberfest Santa is a quintessential German Christmas ornament. Hand-crafted in Poland, the exquisitely detailed Christmas ornament with glitter accents depicts Santa in traditional German lederhosen and hat holding a mug frothing over with beer. Standing five inches tall, this German glass Christmas ornament will be the perfect addition to any Tannenbaum this year.